The inner conductors are correctly color-coded to ABYC standards, yellow and red. 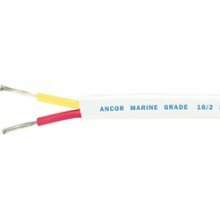 Ancor recommends yellow wire as DC negative because black is standard color for AC hot. Because of the wide spread use of inverters, power generators and shore power connectors, even today's smallest boats pose a risk of inadvertently cutting into AC wires when working on DC systems. White common jacket. Made to surpass the highest UL Boat Cable standards.